There has been around a 1.0 degree rise in temperatures to date (2018) [iv]. This means the remaining total of cumulative emissions (“carbon budget”) needs to be small enough to keep further temperature rises to around 0.5 to 1.0 degrees if it is to meet targets of limiting temperature rises to 1.5 to 2.0 degrees. 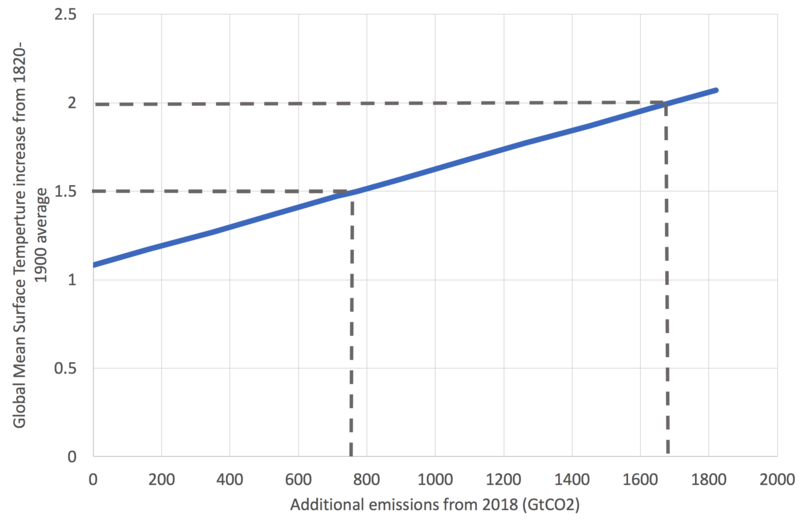 The remaining carbon budget from 2018 for meeting a 1.5 degree target (with 50% probability) is around 770 GtCO2. 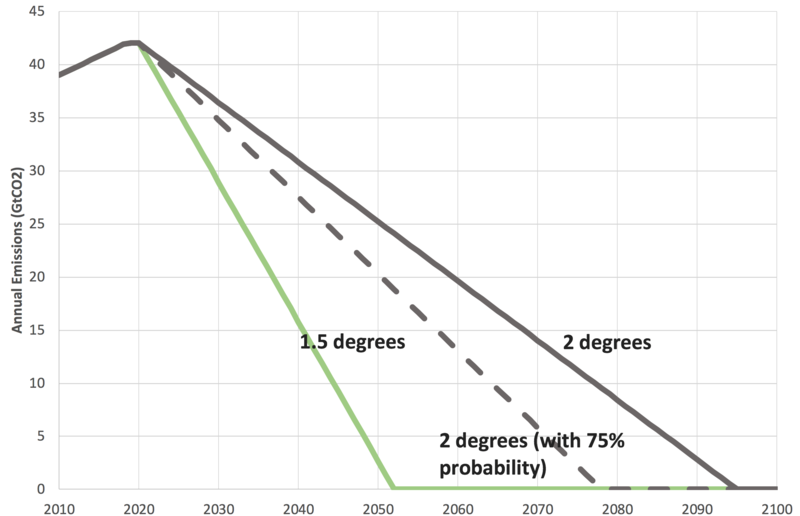 The remaining carbon budget for meeting a 2 degree target (again with 50% probability) is 1690 GtCO2[v]. This is illustrated in Chart 1, which shows temperature rise (median estimates) against additional emissions from 2018. Net emissions continue approximately flat at 2018 levels (of around 42 GtCO2a. [vi]) until they start to decrease. 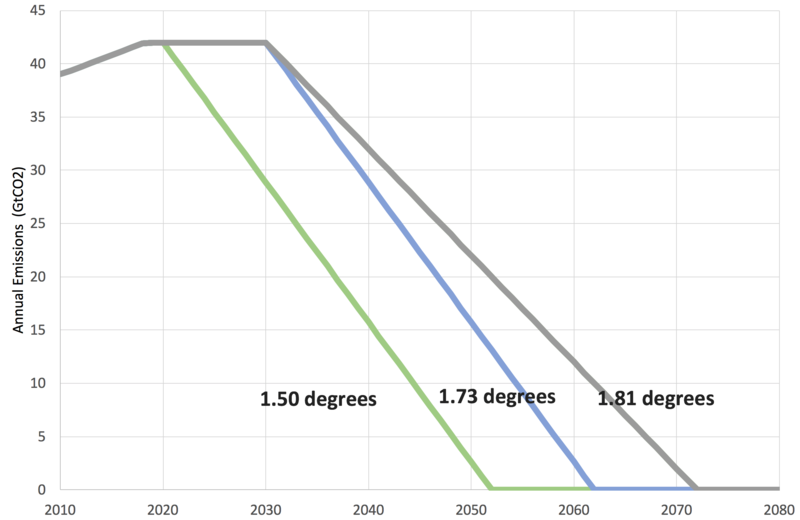 Each decade the starting point for emissions reductions is delayed (for example from 2020 to 2030) adds 0.23 degrees to the temperature rise if the subsequent time taken to reach zero emissions is the same – see Chart 3 below. This increase is even greater if emissions increase over the decade of delay. This is a huge effect for a relatively small difference in timing.